The temporomandibular joints (TMJ) connect your jaw to your skull, allowing you to talk, chew, and yawn. The TMJ joints allow your jaw to smoothly move up, down, and from side to side. If you have ever experienced pain or a “clicking” sound in your jaw when you eat, you may have TMJ disorder. While the exact cause of TMJ may be difficult to determine in some cases, our oral surgeons are highly trained in diagnosing and treating the symptoms of TMJ disorder. The majority of patients experience a reduction in the severity of symptoms after undergoing a TMJ disorder treatment. TMJ disorder can develop in patients who clench or grind their teeth, patients who have damaged their jaw through an injury, or patients with arthritis. Stress and anxiety can result in a tightening of your jaw muscles, which may also contribute to TMJ disorder. 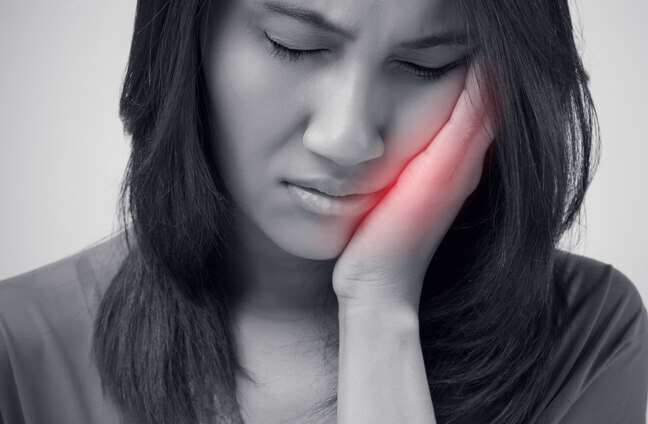 Certain diseases of the connective tissue may also cause some patients to be at a higher risk of developing TMJ disorder. TMJ disorder can cause a great deal of discomfort and damage if not treated. Some types of TMJ disorders can even lead to more serious conditions. What are symptoms of TMJ disorder? What can I do to relieve the pain of TMJ disorder? In addition to the actions listed above, wearing a night guard can help relieve the symptoms of TMJ disorder. A night guard is a temporary, clear plastic appliance that fits over the top and bottom teeth to create a protective barrier. A night guard relaxes your jaw muscles and helps you to stop clenching or grinding your teeth while protecting the cartilage and joint surfaces of your jaw. At Staten Island Oral & Maxillofacial Surgery, we offer several different treatment options to our patients with TMJ disorder. Once an evaluation confirms your TMJ disorder diagnosis, our oral surgeons will discuss the proper course of treatment for you. TMJ disorder treatments are designed to relieve muscle spasms and joint pain, which is usually accomplished with a pain reliever, anti-inflammatory, or muscle relaxant. If necessary, steroids can be injected into the joints to reduce pain and inflammation. It is important to realize that no single treatment can heal TMJ disorder completely, and it takes time for TMJ treatments to become effective. However, our treatment options can help you have a healthier and more comfortable jaw. At Staten Island Oral & Maxillofacial Surgery, we offer popular TMJ disorder treatments such as arthroscopy, open arthroplasty, and total joint replacement. What is arthroscopy for TMJ disorder? Arthroscopy is a TMJ disorder surgery that uses an arthroscope (a tube that is often thinner than a pen), which is attached to a small camera that allows our oral surgeons to see an image of your temporomandibular joint on a screen. Surgical instruments can be inserted through the arthroscope to help relieve any tension or pain associated with your TMJ disorder. There are a variety of techniques our oral surgeons may perform during arthroscopy, depending on your individual symptoms. Our oral surgeons may flush your temporomandibular joint, tighten the joint, apply anti-inflammatory medication, reposition your disc, or remove any tissue or cartilage that negatively affects your jaw’s functionality. Your arthroscopy surgery will vary depending on your symptoms and individual case of TMJ disorder. Arthroscopy surgery is performed using general anesthesia to maximize your comfort. Most arthroscopy procedures can be performed in just thirty minutes, but the length of your arthroscopy procedure can vary depending on the type of procedure you are having done. Although your jaw’s range of motion and mobility may be lessened during your recovery, we will suggest physical therapy for your jaw to promote proper healing and increase your jaw’s range of motion. How can arthroscopy help TMJ disorder? Arthroscopy is a minimally invasive TMJ disorder treatment that can help reduce tension and pain in your temporomandibular joints, as well as increase your jaw’s functionality and range of motion. Arthroscopy can help relieve pain in your jaw that is a result of TMJ disorder by treating the discomfort at its underlying cause. By flushing the joint, applying medication, or removing scar tissue during arthroscopy surgery for TMJ disorder, our oral surgeons can help reduce your discomfort while improving your jaw’s functionality. What is open arthroplasty for TMJ disorder? Open arthroplasty is an open-joint TMJ disorder surgery that can help reduce the pain or difficulty of eating, speaking, and swallowing that is often associated with TMJ disorder. Open-joint arthroplasty is a TMJ disorder treatment designed to help patients who experience a high level of pain or a low level of functionality in terms of their jaw’s movement. During open arthroplasty, our oral surgeons can repair, relocate, substitute, or remove parts of your temporomandibular joints that may cause pain or discomfort. A small incision will be made to access your temporomandibular joint during open arthroplasty. Our oral surgeons may remove any hardened cartilage or scar tissue during your open arthroplasty procedure through this incision. In more severe cases of TMJ disorder, your disc may be removed and replaced with a synthetic disc for the best results. Open arthroplasty is performed under general anesthesia for your comfort, and most patients are able to go home the same day. How can open arthroplasty help TMJ disorder? The majority of patients experience significant improvement after undergoing open-joint arthroplasty. Open arthroplasty is designed to improve the functionality and range of motion of your jaw by treating the cause of the pain at its source. Jaw exercises are important to practice once cleared by our oral surgeons, as they can promote proper healing and help increase the functionality of your jaw after arthroplasty surgery. What is total joint replacement for TMJ disorder? Total joint replacement for TMJ disorder uses synthetic devices that replace the joints that attach your jaw to your skull. By using joint prosthesis, our oral surgeons can help provide you with jaw mobility and reduce pain or discomfort related to TMJ disorder. Described as a ball-in-socket joint, the temporomandibular joints are comprised of the “ball” (also called the condyle) and the “socket” (referred to as the fossa). A condylar implant will be placed through an incision below your jaw, and a fossa-like implant will be positioned through an incision in front of the ear. These two implants will act as your temporomandibular joints, providing you a pain-free, wider range of motion. How can total joint replacement help TMJ disorder? Total joint replacement can help you with your TMJ disorder if you have inflammatory arthritis that is unresponsive to other treatments, a limited range of motion in the jaw, difficulty eating and chewing, or pain in your temporomandibular joints. Total joint replacement can help grant you a wider range of movement and reduce pain, discomfort, and other side effects of TMJ disorder. How can I find out more about TMJ disorder treatments? For more information on TMJ disorder treatments, please contact Staten Island Oral & Maxillofacial Surgery to schedule an appointment with oral and maxillofacial surgeons David Hoffman, D.D.S., F.A.C.S., Lydia J. Lam, D.D.S., Steve Yusupov, D.D.S., M.D., and Mark Stein, D.D.S., M.D. at 718.226.1251.